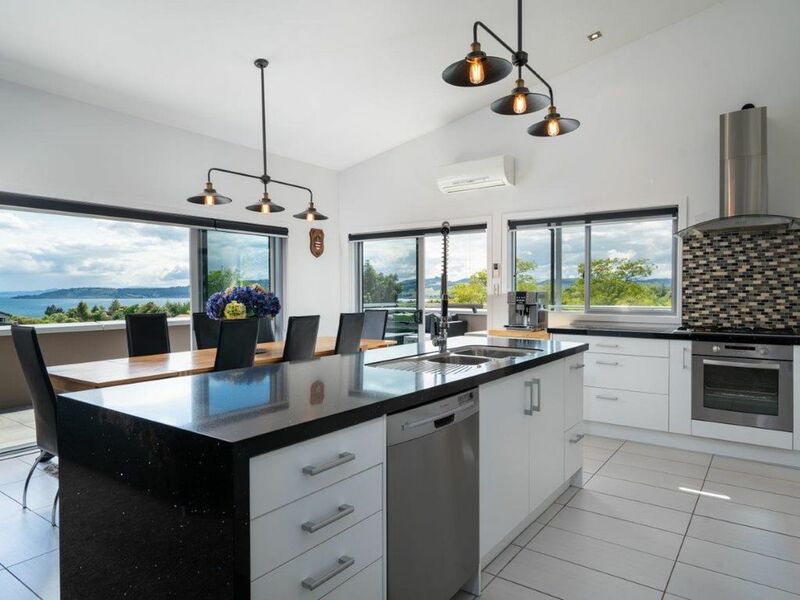 Magnolia Rise Taupo beautiful home sleeps seven with two bathrooms. Beautifully appointed home commanding stunning lake and mountain views. Close to town , walk to De Brett’s hot pools and walk to lake. All bedrooms have own television and the media room has Sky TV and surround sound. Master has en-suite. The open plan kitchen and lounge flow onto substantial decking for easy living and entertaining. Kitchen has all modern amenities including dishwasher, microwave and six hob gas cooker. The main bathroom has spa bath. There is ample parking for cars, boat or campervan. Treat yourself to special living. Also has a seperate toilet and hand basin. Very nice home with plenty of space for all, well-equipped kitchen and bathrooms. Lovely views of Lake Taupo and easy access to town.